The latest out in the 'practical' range. The piece measures 40" overall. Differs from practical katana in that it has an updated tsuba (guard), genuine rayskin handle wrap and uses a wrap (Tsuka-Ito) specially developed for its gripping qualities. 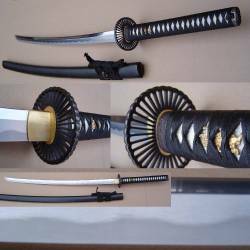 Also features a superior polish producing a more prominent true hamon on the blade and can be dismantled like the more expensive traditional swords, stuninng. 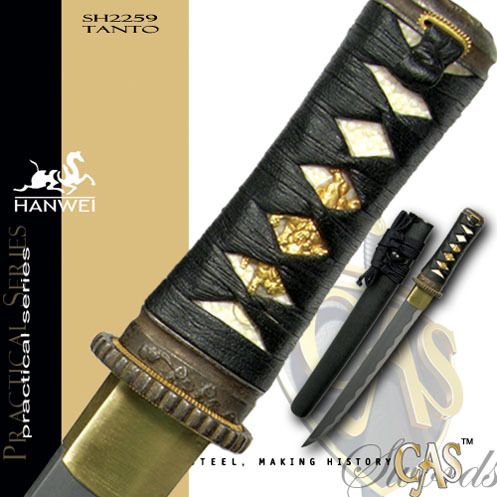 Please bear in mind this sword is still in the practical series and while finsihed to a higher standard than any sword in it's price band, the blade is not as cosmetically flawless as the more expensive Chen swords. 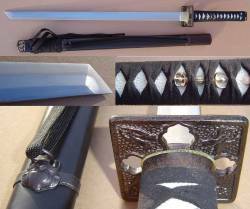 No License needed to buy this traditionally forged, handmade sword. 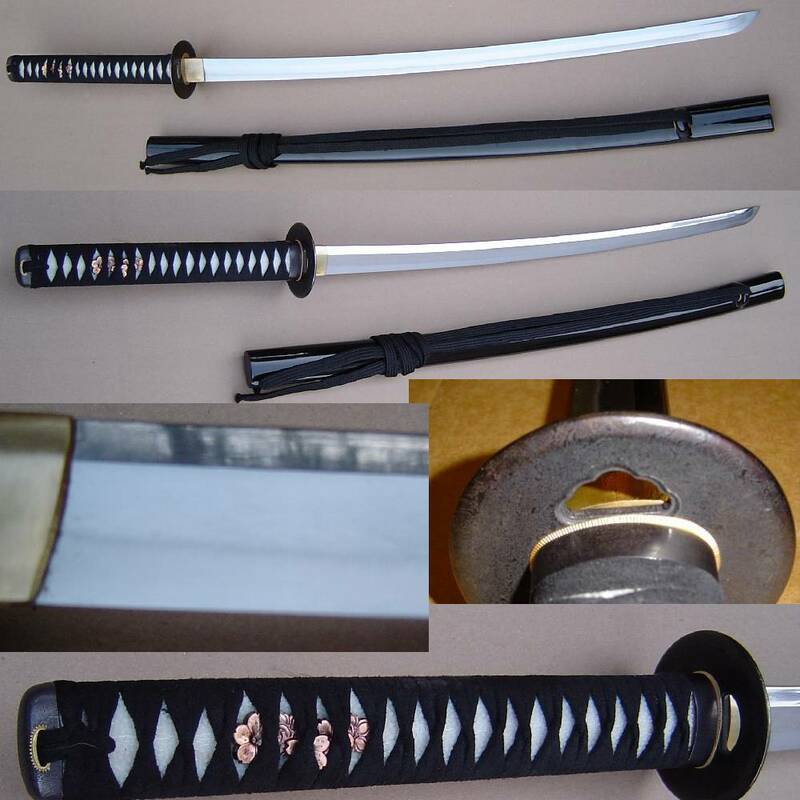 The Bushido Katana has a razor sharpened, hand tempered, folded carbon steel blade. Genuine white rayskin handle with brown japanese cotton cord wrap and a blackened and bronzed iron tsuba, featuring relief artwork of a Samurai battle scene detailed in silver and gold. 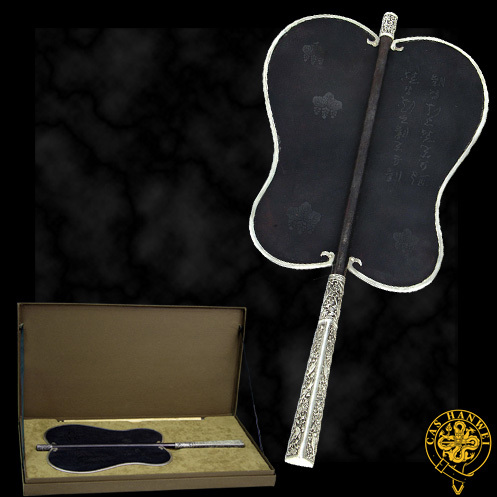 The wooden scabbard with old gold lacquer finish inlaid with brass sakura flowers. With traditional cleaning kit and high quality protective sheath. 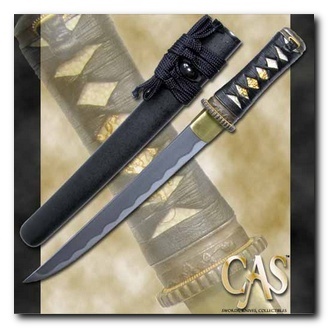 This sword is designed for everyday use by the professional martial artist and as a sword to display with pride. 40" Overall with a 27" Blade. 34.2" Overall with a forged, sharpened and differentially tempered 22.5" carbon steel blade. Imitation rayskin handle with black cord wrap. Black coated metal tsuba. Oversized wooden scabbard with black lacquer finish, suitable for other ninja uses. The Practical Shinobi Ninja-to whose construction patterns closely that of the Practical Katana, is a wonderful addition for those studying the Way of the Ninja. The blade is made of hand-forged high-carbon steel and is differentially tempered using a traditional claying method. The tsuba, fuchi, koshira and kojira are crafted antiqued black iron, the ornate tsuba displays the kuji-kiri (energy-channeling hand positions) employed by the mystical ninja. The tsuka is wrapped in a synthetic ray skin (same), available in black (SH2268) or white (SH1071), and the tsuka-ito is done in imitation black leather. The saya has flat black finish with demon-head bindings for the black Japanese cotton sageo and an intricate kojiri on the end of the saya. 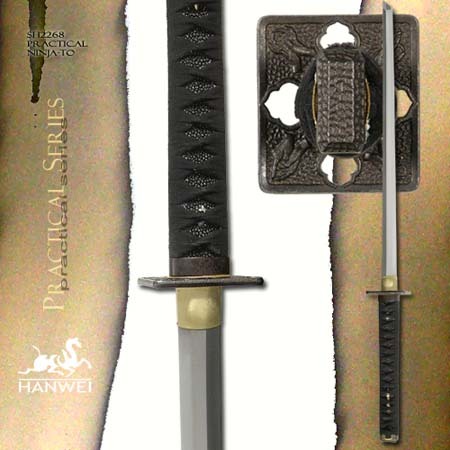 A sword no practitioner of Ninjutsu should be without. Our Japanese kabuto and mempo are superbly constructed, beautifully detailed and a great value. Model AH2081, based on a museum piece of unknown provenance, doubles as an exquisite stand for a katana and wakizashi set. 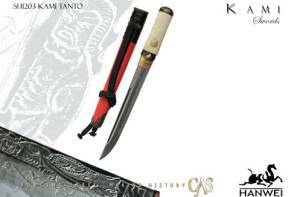 Each piece in the Kami group has a hand-forged and folded ASSAB-K120C powder steel blade, differentially tempered to produce an HRC60 edge, HRC40 back and a distinctive hamon. Saya are deeply lacquered in red, with a black ring-carved section at the sageo. The ray skin used on the tsuka is of the highest quality, and the tsuka-ito on the Katana and Wakizashi and the sageo on all three pieces are woven from best quality Japanese silk. The Fuchi, Kashira, Kojiri, Koiguchi and Kurigata are all made from blackened bronze, with decoration in relief and selective detailing of copper, silver and gold. The Tsuba of the Katana and Wakizashi, depicting the Kami, or Guardian Warriors, are made from hardened blackened copper, with decoration in relief and selective silver and gold detailing. The Habaki is of two-piece construction, the inner section being copper and the outer section gold-plated brass. The blades are engraved, at the Habaki, with a hand-engraved "Fudo" horomono, a traditional blade carving from the Edo period. The blades of all three pieces are grooved on both sides, and each piece features a long Kissaki. The War Fan was an essential signaling device on the battlefield, used by officers to command and direct troops. The gumbai-dansen version was typically round in shape and stiff with a prolonged stem as a handle. The fan could also be used as weapon using the handle to strike and the stiff fan to block with. Our war fan is based on an original from the Edo period and is inscribed with Chinese military philosophy from Sun Tzu’s �Art of War". 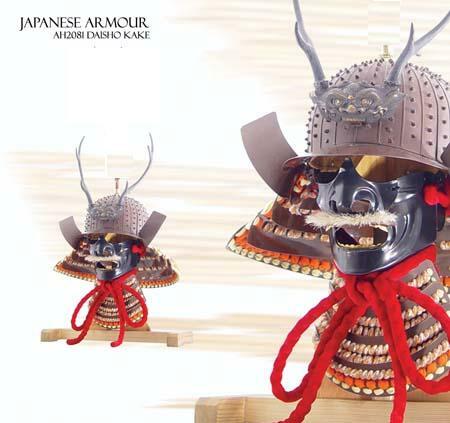 Japanese military leaders were well versed in the strategies of Sun Tzu and it is not surprising to find his maxims gracing antique war fans.